Fri., May 13, 2016, 6 a.m.
Spokane and San Francisco are two west coast cities with little in common, especially since the last of The Lilac City’s trolleys was torched, but the original need for trolleys highlights perhaps the lone similarity between the two cities: hills. 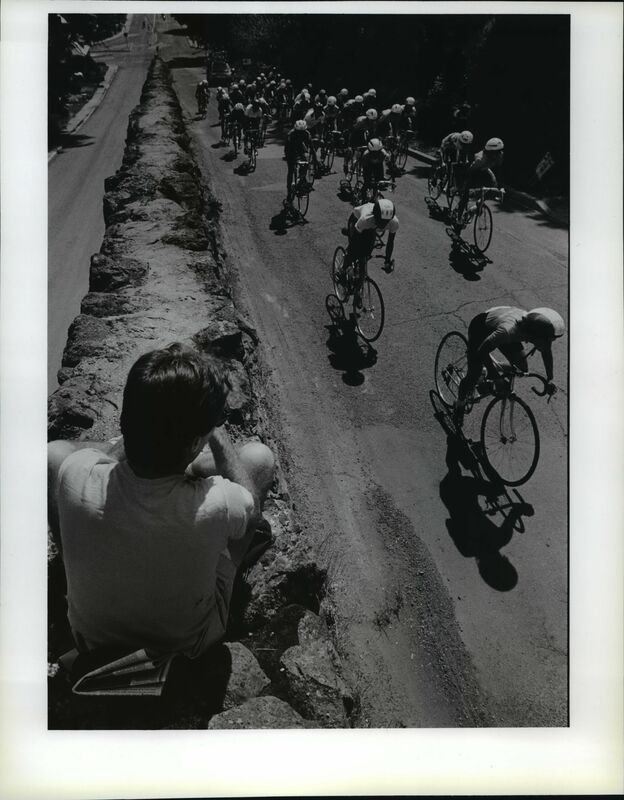 San Francisco’s solution to one of their more prominent hills is known as “The Wiggle”: a route used to avoid the steeper sections of hills even before European settlers arrived to the Bay. Currently, it describes the right turns to the north and left turns to the west used by bicyclists to avoid the steeper routes to the Haight-Ashbury neighborhood. San Francisco has prominent hills, but they are generally shorter, steeper and very few traverse the width or length of the entire city. 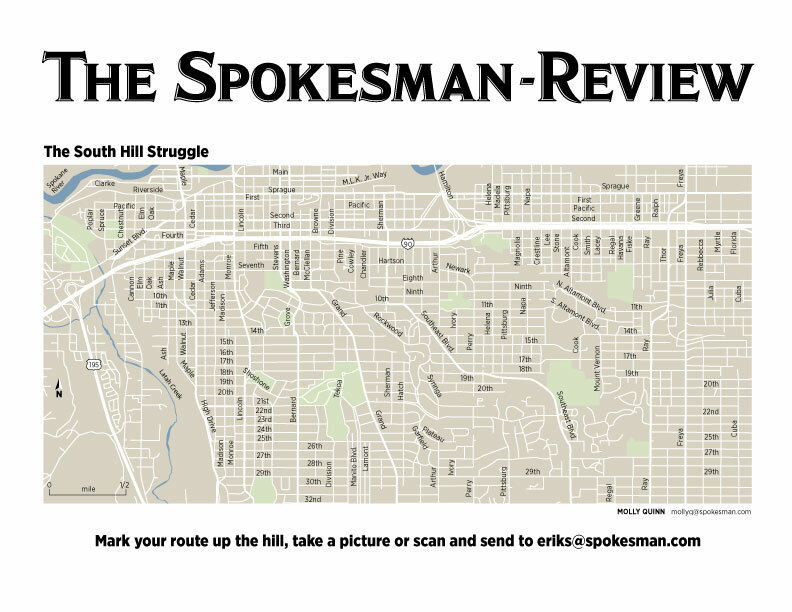 Spokane’s South Hill stretches from the city’s east boundary to its west, its terrain varies wildly from block to block and Rockwood Boulevard’s diagonal cut across the hill makes a single, intuitive route difficult. Thus, a trip to Huckleberry’s from downtown will either feature a lengthy detour or a couple blocks of severe elevation gain, while traveling all the way to 57th offers the opportunity to take the gradient over a longer stretch. The benefits of having a named route to tackle a particularly prominent hill are immediate. The Wiggle knowledge was once a rite of passage for San Franciscan bicyclists, but has since become a recognized city route, complete with signage, wayfinding markers and a consciousness to create a “complete street” with the knowledge bicyclists and pedestrians generally prefer the less severe path. So what is the best route up the hill avoiding the steepest hills, less-than-desirable road conditions leftover from the old trolley routes, and sections prone to heavy traffic? Anecdotally, the most common route up the South Hill seems to be some combination of Jefferson, Adams, Cedar and/or Maple, but these suggestions ignore the entire eastern portion of the South Hill. In hopes that both local and visiting bicyclists can make it up the South Hill safely and enjoyably, we are taking recommendations of “Wiggle” routes from local bicyclists. Using a map of your own or downloading this one and photographing or scanning your completed route, we would love to see routes to the lower, middle and upper South Hill. Map your entire commute or just your jaunt up the South Hill. Both are appreciated. Please send materials to eriks@spokesman.com. Posted May 13, 2016, 6 a.m.
Erik Solberg joined The Spokesman-Review in 2016. He is an Editorial Assistant for the newsroom compiling court records and most entertainment and social calendars for the Today and 7 sections.